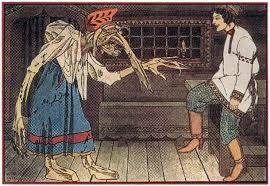 Baba Yaga is a Russian folktale character closely associated with the boogeyman, or the forest witch in Western myths. Baba Yaga sometimes appears as one person, and other times triplets bearing similar names, appearance, and personality, with different roles ranging from a fairy tale donor (a character who gives tasks to the hero) to an evil witch living in the woods. “Baba Yaga”, the most well-known story, depicts the titular character as an evil witch living in the forest, known to eat children by the villagers. The story starts with a happy family, consisting of a peasant father, a mother, and one or two children depending on the version of the story. The children would often play with their family (“They smile upon each other over a table filled with jam, and play peek-a-boo on the sides of the samovar.”) and even when their mother died of sickness, the family was still happy. Everything changed some time later, when their father took a second wife in a misguided intention to make the children happy. The children were abused, fed scraps of hard bread which they wetted with their tears, and forced to do chores as their stepmother talked ill things about the children in front of their father. One day, the stepmother decided that she should get rid of the children for good, and asked the children to go to their ‘auntie’ in the woods to fetch needle and thread needed for clothing. The children knew of their wicked stepmother’s intentions, however, they could do nothing lest she talks ill about the children in front of their father yet again. The elder children, smarter than the younger, first went to their real auntie for advice. Their real aunt was powerless to help them, but they are given a large piece of ham each, a ribbon, and a pretty handkerchief, along with the hint that they should do well to others and never say bad things about them. Armed with the hint and the supplies given by their aunt, they set out into the forest. They came across a gnarled tree, and they tied their ribbon onto one of the bare branches. Soon after, they reached the witch’s house, with fences so high and a cottage standing on bony chicken legs. When they opened the gate, it made a loud squeak, as if the act of moving hurts. The children noticed a can of oil on the ground, and poured the last drops of oil onto the hinges. Near the cottage door, they met a crying maidservant and a huge but thin dog gnawing on old bones. They gave them their handkerchief and one piece of ham, respectively. They knocked on the door, and were greeted by an old woman with a long nose. The woman asked them to come in and continue weaving on the loom (making a click-clack sound) while Baba Yaga fetched the needle and thread. The maidservant was ordered to fill a bath and prepare spices to cook the children. When they saw the maidservant, they begged for her to help. She helped them by poking holes into the sieve she used to carry water, making the bath take longer to be ready. The children then spotted a thin cat waiting on the mouse hole, and gave it a ham. The cat gave them a towel and a comb, and told them to escape while it keeps the loom spinning as not to alert the witch. The children ran away as fast as they could, throwing the comb and the towel behind them to keep the witch from catching them. Defeated, the witch came back to her cottage, cursing her servants for helping the children escape. In this story, Baba Yaga takes the role of a fairy tale donor (task giver) with an ambiguous alignment. There are several variations to this story, but most begins with the story of a prince and his three sisters. Before the king and queen died, they told the prince to give the princesses to the first suitable suitors. In the following years, the princesses are wooed by a falcon, an eagle, and a raven, and after three years, the prince was left alone in his kingdom. The prince decided to mount his horse and go search his sisters, and he came across a battlefield with the corpses of many soldiers slain. He asked who have slain this man, and a living man replied that all of them have been slain by the princess Marya Morevna. He kept on riding and stopped at a tent where Marya is, and she gave him a place to stay for several days. Within the time they stayed together, they fell in love and married each other. One day, the princess has to do an errand, and said to the prince he can do anything but open the closet in her room. Curious, the prince opened it and saw a weakened man tied with chains. He gave the man a drink, and with the drink, the prisoner’s magic powers came back to him. He kidnapped Princess Marya and left the prince alone. The attempts to bring the princess back proved fruitless, and he was cut up, put in a barrel, and thrown into the sea. The three birds remembered him, and he was brought back to life when they poured Water of Life onto his body. He is then tasked with bringing a magical horse from Baba Yaga’s stable so he could be as fast as Koschev and defeat him. The prince went on in search of Baba Yaga, and he went through trials to even reach her, including rivers of fire and a dense forest. He is tasked with guarding the stable for three days, and if no horse disappears, he will be given a horse stronger than what Koschev has. The task was difficult, as Baba Yaga told the horses to keep on dispersing each day, but in the end, the prince won a horse from the witch, and went on to defeat Koschev. In several stories, the Baba Yaga is depicted as three sisters, each more evil than the last. This story begins with a boy living with his merchant father, and they were happy until the father decided to take a second wife. The stepmother married the merchant, but decided that she liked the son instead. Meanwhile, the son fell in love with a princess from an unknown kingdom (the Thrice-Tenth Kingdom). Knowing this, the stepmother gave the son an enchanted pin that made sure the son was asleep every time the princess came to visit. This plan succeeds until the third time, as the prince got angry and slashed the head of the stepmother. Knowing the rumored wise Baba Yagas living in the forest, he set out to ask them where the kingdom is. He was continually dismissed by the Baba Yagas. The first one told him to ask the second sister, and the second sister doesn’t know the answer but gave him a hint if he is in danger, ask the third sister to give him three horns and blow each louder than the last. Sure enough, the last Yaga sister tried to eat him, and he asked for three horns and blew them according to the hint. All kinds of birds swarm the hut and a firebird offered him a ride to the kingdom, where his love is. There are many versions of each story, and some even feature Baba Yaga as a closely related folklore figure called “Jezibaba”. If you like this article, you might be interested in other articles about Russian culture, such as History of Matryoshka, History of Russian Banya, as well as History of Christmas and Christmas Celebrations and Traditions in Russia.